MVK of Greater Cincinnati was founded in 2005 to provide at-risk kids with event tickets to reward and motivate them to overcome significant life challenges. We work to enhance the self-esteem, academic achievement, and social development of under-served kids through opportunities to attend sporting events, cultural arts and unique experiences. MVK has built a network of community sponsors, business leaders and individuals that allow us to go beyond simply providing tickets. Together, we provide these deserving kids with experiences that have the potential to change their view of their world, their future and themselves. 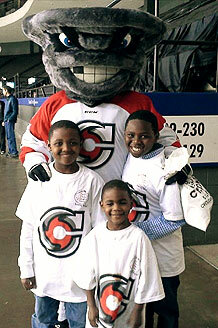 Did you know the Cincinnati Cyclones support deserving kids through MVK? Each year they send approximately 1000 kids/chaperones to their games!